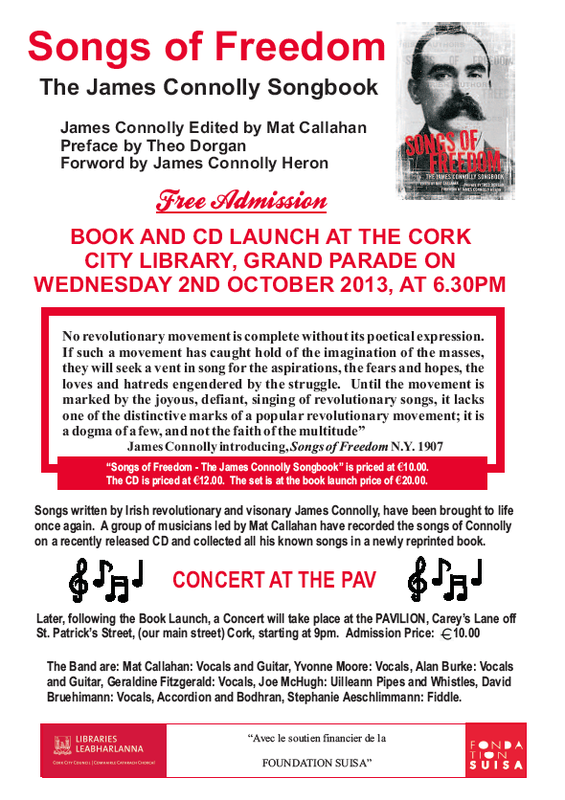 A new edition of ‘Young Connolly’ the seminal account of James Connolly’s early years by the late Sean Cronin, will be launched in the Citizen Press Ltd Office, 24a/25 Hill Street, Dublin 1, on Thursday the 3rd October, at 6.00 p.m.
SIPTU General President Jack O’Connor will launch the book at an event which also marks the formal opening of the new Citizen Press Ltd Offices. The launch will include a discussion on the continued relevance of Connolly’s ideas to progressive politics in Ireland chaired by Workers’ Party Treasurer Sean Garland. Young Connolly is a study of the 1913 Lockout and 1916 Rising leader’s early years in Ireland. Written by the former Irish Times journalist and leading political activist Sean Cronin who died in 2011. The Citizen Press Ltd is an independent publishing house committed to printing books recording Ireland’s working class history and culture. The Citizen Press Ltd also publishes LookLeft, Ireland’s leading progressive magazine. Please note: There are Concerts with Book/CD sales at the following venues as well as the Cork events as listed on the poster Oct. 3rd. 8pm at Liberty Hall, Eden Quay, Dublin 1 and Oct. 5th, 4pm at Sandinas, Water St. Derry City. Posted by irishelectionliterature in Capitalism. In a series of startling studies, psychologists at the University of California at Berkeley have found that “upper-class individuals behave more unethically than lower-class individuals.” Ongoing research is trying to find out what it is about wealth — or lack of it — that makes people behave they way they do. From the IT this morning, those figures are pretty convincing. When undecided voters are excluded, the poll indicates the abolition proposal is backed by 62 per cent, with 38 per cent in favour of retaining the Upper House. Any space there for an upset? Some 44 per cent of respondents said they would vote to abolish the Seanad, 27 per cent said they would vote to retain it, 21 per cent did not know how they would vote and 8 per cent said they would not vote. Even if one is deeply dubious about the latter figure which will likely be multiples of that larger, it doesn’t look good for the Seanad. Interesting to consider what the political outcomes of abolition could be? Good for Kenny or FG or the LP or SF? And what of the remaining Senators eking out the days to their end? A newly minted awkward squad or likely to go with good grace given the electorate has spoken? 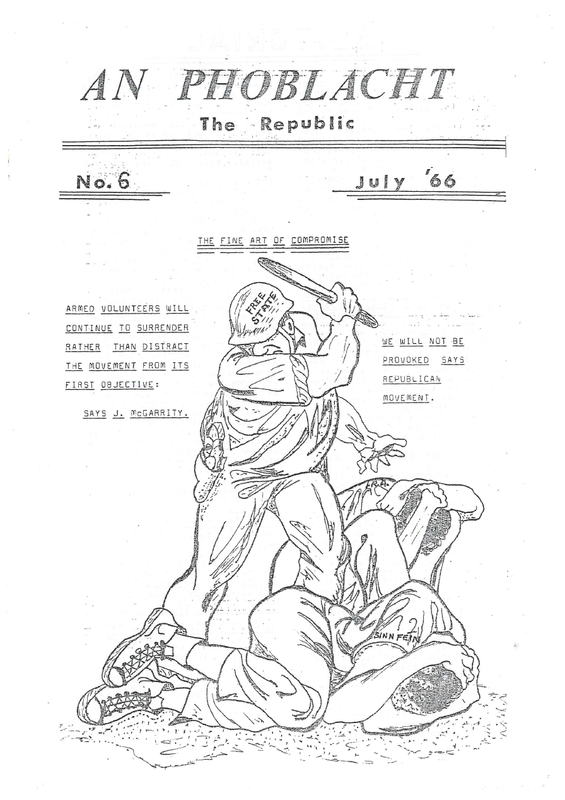 Posted by WorldbyStorm in Irish Left Online Document Archive, Irish Revolutionary Forces [1960s]. 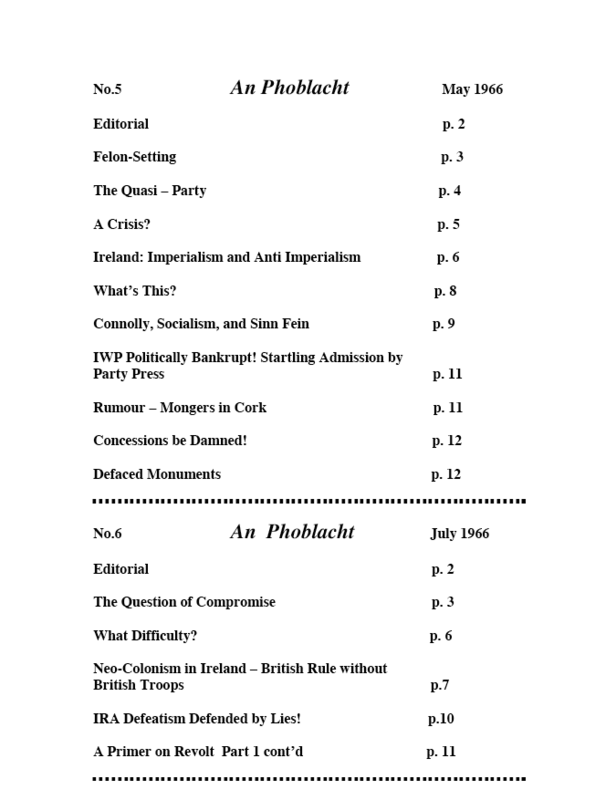 As noted before, it is intended to bring the full run of An Phoblacht’s from the IRF over the next few years with editions being posted up on a regular basis. My thanks as always to Jim Lane for providing the Archive with these documents. These editions are an very useful addition to the documents already posted up from this source in the last few months. As before in order to give a sense of their content a limited selection of quotes from the editorials will suffice. In our last issue we presented the I.R.A. Programme of 1933 as being indicative of the goals contemporary Republicans must strive to realise if they are to justify their continued opposition towards the Free State regime. We also called on the present membership of the I.R.A. to exert their influence and DEMAND that the organisation return to its revolutionary position by readopting this programme. At this stage, then, the immediate task of all revolutionaries is to foster the division between Revolutionaries and Reformists by propagating the slogan: A RETURN TO THE PROGRAMME OF 1933. And if there still are revolutionary elements within the I.R.A., they must force the issue so as to determine the prospects of rejuvenating that body. If the I.R.A. persists in its allegiance to neo-Griffithism, then rebels in it must emerge and join hands with the revolutionary vanguard that now exists outside the fold of the I.R.A. and engage with them in the building of a new movement. Other groups which exist in various parts of the country, and even individuals, should also consider our proposition. Because as has been said already, unless the I.R.A. is prepared to return to its former position, and quickly, it will be up to representatives of all progressive groups to convene and decide on the formation of a new movement. The editorial in issue No. 6 continues on from that in the previous edition, enlarging, as it were upon the implications of that earlier editorial. During recent months there has been considerable talk about ‘extremist groups’; or ‘splinter groups’ which have broken away from the Republican Movement. And it has ben intimated that the main differences between such groups and the ‘official illegal organisation’ are primarily ones pertaining to the use of violence. The organisation responsible for the publication of An Phoblacht has been listed as one such group; consequently, it is as well to make our position clear on this issue. First of all, we do not consider ourselves a so-called ‘splinter group’. We are a Revolutionary Socialist-Republican Organization, which was founded on the basis of the Republican Programme of 1933. We base our appeal for support on the realisation of this programme; and not on the question of violence as such. The primary differences between our position and that of the Republican Movement, are those which invariably exist between a revolutionary movement and a reformist one. In our view, the Republican Movement is no longer an Irish Republican body in the traditional sense. The social, political and economic principles which now motivate its actions are more in tune with ‘Free State nationalism’ than with the Socialist-Fenian gospel that was baptised in blood in 1916. Indeed, it can be claimed without fear of contradiction, that the only real difference between the contemporary Republican Movement and other Free State parties is that while the former insists on the implementation of Article 2 of the 1937 Free State Constitution, the latter ignore it completely. In a word there is no basis for a rapprochement between ourselves and the Republican Movement; for as long as it persists in its present crypto-Free State course. – and the fact of whether that movement decides on the use or no-use of violence to get state power has no real bearing on the issue. Our numbers may be small today, but the day will dawn when the people will appreciate the correctness of our stand. Then we will have a real revolution in Ireland; a revolution whose aim will be absolute freedom. Below is a full index of the contents of No’s 5 and 6. Emer O’Kelly lets the mask slip. Alternatively, we can cheer loudly at the suggestion by the Minister for Education Ruairi Quinn, that ASTI members may face the possibility of compulsory redundancy. When the undecided voters are excluded the margin is 64% in favour of abolition and 36% against the Government proposal that will be put to the people on 4 October. Hard to understand Ind/Other drop, particularly when set against other polls. Will have to look at the details. Posted by WorldbyStorm in European Politics. …and not before time. A crack down on Golden Dawn. As someone said passing this on, a very fundamental critique of the Labour Party approach by Professor Brian Lucey, (TCD). BTW, well worth reading the link to the Eddie Hobbs twitter feed in the above article. Let’s just say that he doesn’t cover himself in glory.